(Nanowerk Spotlight) The hazard assessment of graphene and related carbon nanomaterials has already been discussed extensively in the literature (see: "Nanotechnology innovation safety aspects – the case of graphene"). Less consideration has been given to the growing class of non-carbon two-dimensional (2D) materials such as transition metal dichalcogenides (TMDCs), hexagonal boron nitride (hBN), and black phosphorus (BP). These materials present a broader range of compositions, chemistries, and physicochemical properties and thus a wider range of potential toxic responses and environmental impacts. A new paper in ACS Nano ("Assessing and Mitigating the Hazard Potential of Two-Dimensional Materials") reviews the studies to date that have addressed the toxicity of 2D materials, particularly emphasizing the preparation methods and resulting physicochemical properties that dictate their interactions with biological systems. In addition, due to its importance in determining exposure risk, this review summarizes key results from the literature concerning the environmental fate of 2D materials. The authors, led by André E. Nel from the California NanoSystems Institute, and Mark C. Hersam from Northwestern University, hope that a thorough understanding of these issues will inform ongoing efforts to realize the design of safer 2D materials. The physicochemical properties of 2D materials are a direct result of synthesis and processing techniques. A variety of preparation methods exist for monolayer or few-layer 2D materials, which can generally be separated into either bottom-up or top-down approaches. Bottom-up approaches involve the use of atomic or molecular precursors to grow the 2D material. Top-down approaches involve the isolation of 2D materials from bulk layered crystals. Composition – Chemical composition is one of the most important considerations for determining the biological interactions and fate of 2D materials in vivo. The surface chemistry and the dissolution of the material will be determined by its chemical composition, which will in turn affect the cellular interactions, uptake, and biodistribution. Due to their relatively infrequent study thus far in the field of toxicology, cytotoxicity has been the most widely used metric for gauging the biocompatibility of emerging 2D materials. This empirically reported cytotoxicity provides some insight, but a deeper mechanistic understanding is required to fully assess the hazard potential. Exfoliation – As layered materials are exfoliated, the fundamental properties of the material change. Similarly, biological interactions with layered materials vary as a function of exfoliation state. Lateral size and thickness – The biological response to a 2D geometry is unique, and the physical interactions of 2D materials with cells are expected to vary based on their aspect ratio and mechanical properties. Thus, the characterization of lateral size and thickness of 2D materials is critical in order to quantify the aspect ratio and its effects on the biological response. Thus far, there are no comprehensive studies focusing on the size effects of the biodistribution of 2D materials, and therefore further in vivo investigations of this nature are needed in the future. Structural forms – Most toxicity studies to date have focused on dispersions of 2D materials because many biological applications, such as drug delivery and imaging agents, call for such a format. However, 2D materials are also being explored in a myriad of other applications in which the qualitatively different physical form factors are needed including thin films, three-dimensional constructs, and composites. In these cases, biological interactions will fundamentally differ from those of a well-dispersed 2D material in solution. Surface functionalization – Extensive studies on graphene and related carbon nanomaterials have shown that surface functionalization plays a major role in the toxicological response. Analogous studies on the surface functionalization of postcarbon 2D materials have begun to be undertaken with an eye toward achieving specific biological outcomes and minimizing toxic response. Generally, the surface functionalization of 2D materials will dictate the dispersion stability, the surface reactivity, and the degradation behavior, all of which will contribute to the overall toxicity of the material. Environmental stability and chemical dissolution – Although most TMDCs are considered highly stable, some studies have shown that these materials undergo environmental transformations. In particular, the dissolution of TMDCs has been shown to vary as a function of composition due to differences in the strength and reactivity of the bonds formed between metal and chalcogen atoms. Furthermore, the risk associated with 2D materials will be highly dependent on their transport and transformation in the environment. In order to better assess their ecological and biological risks, further study is required to understand the environmental transformations of 2D materials, which will in turn affect their biological interactions and outcomes. Crystal structure – In addition to the composition, the crystal structure of the material can also play a role in dissolution and biological fate. The authors point out that the lack of thorough material characterization, consistent design of in vitro assays, and mechanistic understanding of the cytotoxic response has led to contradictory reports of the biocompatibility of many 2D materials. Additionally, the cytotoxicity of the 2D materials in most cases is reported as a simple quantification of cell viability, without details of the characterization of cell growth or cell morphology that would enable better comparison across studies. To provide a more comprehensive understanding of the toxicity mechanisms of 2D materials, the authors thus recommend an interdisciplinary approach that relates the physicochemical properties of the materials to specific biological end points. 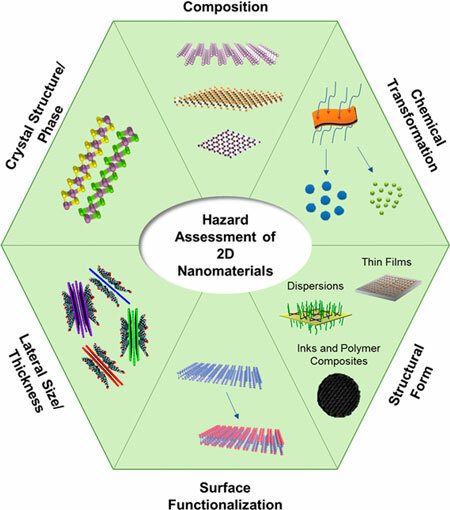 "Overall, a comprehensive assessment of the hazard potential of 2D materials requires an interdisciplinary approach to elucidate the relationship between the physicochemical properties of the materials and the resulting biological outcomes," the authors conclude their report. "In this manner, predictive toxicological models can be developed that will ultimately enable the development of mitigation schemes that will accelerate the safe use of 2D materials in widely used technological applications."